Well it’s time for the third and final entry in my special De Niro month of film reviews. I thought I’d dedicate the month to the method-acting master after finding out that three very different films featuring him would be released this April. I’ve previously reviewed the best part of a dozen of his films on Blu-ray, from one of my personal favourites, the crime thriller Heat, to, more recently, the gangster epic Once Upon a Time in America and the boxing biopic Raging Bull, arguably a contender for his best movie, and best performance, of all time. April saw him take what I felt to be a thoroughly wasted supporting role in the intriguing high-concept thriller Limitless – which is nearing the end of its run in UK theatres – as well as headlining his first threequel, Little Fockers, the surprisingly enjoyable third and perhaps final entry in the Meet the Parents series which actually includes possibly all of De Niro’s most financially successful films, and which has just made its UK Blu-ray bow. Last, but certainly not least, I now get to look at one of his early greats, the brooding psychological masterpiece Taxi Driver, a journey into the mind of a sometimes child-like romantic, sometimes vicious psychopath, featuring another astounding performance from the man who I still regard as the best actor of all time. When it rains, the boss of the City is the taxi driver. Honourably discharged from the Marines, Vietnam vet Travis Bickle takes up a job as a New York taxi driver. He doesn’t care about the long, unsociable hours, the dangerous places he has to cover, or the nasty fares that he has to take, he just wants to keep busy. Eventually he notices a girl who is campaigning for a Senator tipped to be the next President, and summons up the courage to ask her out on a date, but when things go awry he returns to his lonely nights driving a cab and it’s not long before his experiences on the filthy streets of the City start to have an effect on him. He finds it harder and harder to sleep, and becomes increasingly preoccupied with the idea of doing something drastic about the horrors that he sees each and every night; wondering whether maybe assassinating the Senator might somehow make a difference. It seems that the mid-seventies was quite a dark era for everybody involved in this production. The project itself was passed through the hands of various individuals – including director Brian De Palma and actors Al Pacino and Dustin Hoffman – before Martin Scorsese managed to get a hold of it, the Studios agreeing to allow him to direct it so long as he brought with him a certain young actor named Robert De Niro, who had impressed them with his raw breakthrough performance in the earlier Scorsese classic, Mean Streets. Writer Paul Schrader had written the screenplay, and developed the lead character/narrator, Travis, in part based on the diaries of Arthur Bremer (who shot a presidential candidate two years earlier), and in part based on his own experiences of loneliness at the time, having just lost his job and his girlfriend, and living alone in his apartment with nothing but a loaded gun for company. He was interested in the effect of self-imposed isolation on young men of his age, and in the notion of a disillusioned Vietnam veteran taking to the streets in a taxi cab in what was, essentially, a protracted, somewhat suicidal, vigilante campaign. To bring the role to life, De Niro started working long hours himself as a cabbie, listening to taped readings of the diary of the aforementioned assassin Bremer, studying mental illness, and dramatically losing weight during this preparatory period. He was largely encouraged to improvise his dialogue – many scenes were written without any (the coffee shop scene and the famous mirror sequence “you talkin’ to me?”), and created in Travis Bickle a strange, sometimes child-like character who had a particularly direct manner of thinking and talking, with access to neither the social pleasantries nor the diplomatic subterfuge that most ‘normal’ individuals have. He’s also something of a ticking time bomb, clearly disturbed by his experiences in Vietnam, with issues that are compounded by the horrors that he sees on the streets of the Big Apple. His motivations are never clear, his plan seldom lucid, but his thoughts are always on offer, through a clever narration that marries up to the diary that Bickle is painstakingly writing to chart his days and nights on the streets. The end result is something of a nightmarish dream, exactly as director Martin Scorsese intended. By all accounts Scorsese was at the cusp of an all-time low, his cocaine addiction would eventually get so far out of control that he regarded, just a few years later, the subsequent De Niro collaboration – Raging Bull – as his swansong. Ironically, it was that project which many believe saved his life, but back in his Taxi Driver days the director was still living life on the edge. Still his work here was a veritable hallucinatory extravaganza, assaulting the senses with dark visuals and a haunting soundtrack. I have to wonder what the film would have been like had Scorsese been sober – as he connected with the idea of depicting the world through a narcotic haze, and for such a dark subject-matter, it seemed that he was in just the right state of mind. And what of the subject matter? – to this day film critics and experts debate the character design of the central lead Travis Bickle. He’s certainly unique in terms of unusual characterisation – neither a vigilante anti-hero in the vein of the Death Wish or Dirty Harry movies, nor an outright psychotic villain. His path is neither one of definitive redemption, nor utter condemnation. He behaves in a way that no sane person should really be able to associate with, and yet his thoughts and his actions often reflect the concern and even paranoia that the majority of us touch upon each and every day. Whether it’s the lying politicians, the surreal office dynamics, the desire for friendship and intimacy, or the unspoken threat of those around us who could easily harm us – Travis Bickle deals with many of the same issues, only head-on, almost cutting through all the nonsense to get to the very heart of the matter. Yet still, he is clearly very troubled, increasingly aghast with the so-called scum of the streets, and – at the same time – somehow determined to surround himself with the very filth that he despises. Similarly he doesn’t want to be alone, striving to find companionship at every step, and yet he fuels that isolation instead, actually pushing away all those around him and further retreating into his own trouble somewhat fantasy world of dark and reflective diary writing and twisted social commentary. It’s the film’s ability to ride the fine line between a Natural Born Killers-style journey into the mind of a serial killer and a redemptive vigilante narrative that maintains the contradictory nature of the production: you are at once intrigued and shocked by Bickle’s actions, yet also sympathetic towards his plight; aghast at his behaviour, yet drawn in by it and – almost – supportive of it. Travis is neither amoral, nor does he have his own fixed set of moral codes – he doesn’t conform to any set of rules that can be established through the plot; his actions driven by an inner determination which appears to fluctuate depending on circumstance, perhaps even depending on lack of sleep. Scorsese channels his images almost entirely from the viewpoint of the lead character, his camera swirling and spinning, flipping back and forth during moments of confrontation, rotating around the room as Travis surveys his surroundings – following his gaze to what he is looking at, and then returning back to him at the end. We are supposed to see the world through Travis’s eyes, from his twisted standpoint; often slowing down the film for the shots of his face so that he appears to be in an almost dream-like semi-slumber. De Niro perfectly marries up with the director’s vision, channelling all of his acting skills to simply become this character, so much so that you are actually quite scared of this guy. He appears occasionally child-like and innocent, but also capable of extremes that most of us would never be able to countenance. 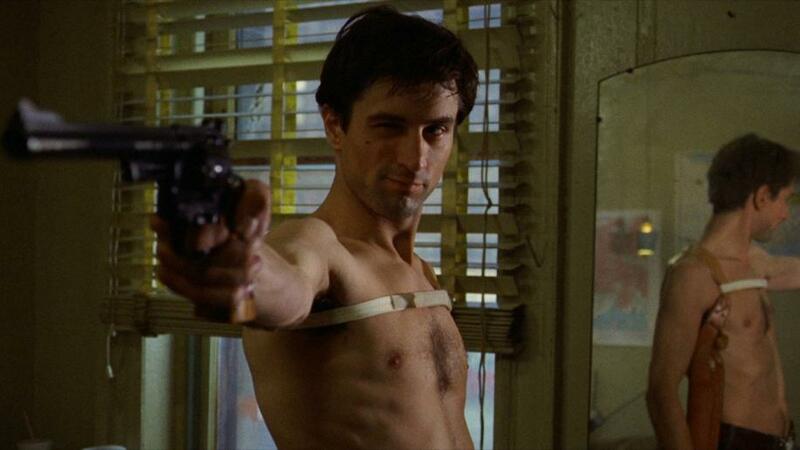 In every shifty glance, every hypnotised gaze, we see not Robert De Niro, but Travis Bickle. His bold statements and uncomfortable confrontations, his determined swagger and sweeping gestures – and, perhaps most importantly, his calculated, paced narration, reflecting the fact that he is putting the words down on paper as he thinks them out inside his head. We actually get inside this head – even if we don’t want to be there – and it is an experience unlike any other. We also get several other young actors on great form, from the beautiful Cybill Shepherd, arguably at the peak of her game, as the object of Travis’s affections; to an extremely young Jodie Foster – 12 years old, controversially playing a 12 year old prostitute, and showcasing some of the talent that she would later be renowned for. Scorsese regular Harvey Keitel takes the role of her enigmatic pimp, and, in just a few lines, absolutely makes it his own; and even Martin Scorsese himself pops up, in arguably his most famous cameo as one of Travis’s more colourful, dangerous fares. The project also marked Hitchcock composer Bernard Herrman’s final score – he did not even get to see the final product, dying a few months before its release – and it’s a perfect accompaniment, a clever juxtaposition of soulful saxophony and brooding, almost military drumbeats which interfere with the flow of the saxophone; it perfect reflects the contradictory nature of the film, the narrative and the character himself; mixing elements of horror, romance and war movie themes and remaining an unquestionably integral element in the success of the production. At the end of the day Taxi Driver is an experience the likes of which you won’t have encountered before, and will likely never encounter again (even if both Scorsese and De Niro are still, apparently, up for a sequel). And it not only reflected the preceding assassination of a presidential candidate in real life but, notoriously, was the inspiration for the subsequent 1981 assassination attempt on President Reagan by John Hinckley. Hinckley’s actions – perpetrated complete with the same striking Mohawk that Travis sports during the latter half of the movie – were admitted to have been due to an obsession with both the movie and with Jodie Foster herself, so much so that the movie itself was played to the jury at the trial, which concluded with a finding of insanity. Could there be any greater (or more horrific) evidence of the legacy of this film? So insightful into such a troubled mind that it can affect somebody – albeit with the right predilections so as to strongly associate with it – so greatly? Many remember Taxi Driver for its famous “You talkin’ to me?” monologue but it is much greater than just this memorable quote. Infused with themes of redemption and with overt religious symbolism, Taxi Driver is also far more than the archetypal vigilante revenge flick which is could, ostensibly, be regarded as. It remains a dark psychological exploration of pent-up feelings and simmering mental illness, ready to explode, just around the corner, within the very society that we all live in. As compelling as it is difficult to watch, as hard to like as it is easy to admire, Martin Scorsese's Taxi Driver is a tour de force collaboration between arguably the finest director-actor partnership in film history. It is an undeniable masterpiece, an experience like no other, and a true must-see classic. Highly recommended. "The whole conviction of my life now rests upon the belief that loneliness, far from being a rare and curious phenomenon, is the central and inevitable fact of human existence." – Thomas Wolf, God’s Lonely Man. Write your Taxi Driver Movie review.